NETWORK FINALS: EMPIRE narrowly avoided a new series low by rising 0.1 in final numbers, while SURVIVOR lost the same. CABLE HIGHLIGHTS: Freeform’s PRETTY LITTLE LIARS spin-off THE PERFECTIONISTS premiered at a lackluster 0.18. Tru had its final night of sole NCAA TOURNAMENT coverage, with games at 0.59/0.28. ESPN’s NBA doubleheader was at 0.59/0.56. MTV’s THE CHALLENGE gained 0.05 to 0.57, with RIDICULOUSNESS at 0.23/0.23, compared to last week’s 0.31. VH1’s BLACK INK CREW rose 0.05 to 0.48. Bravo’s REAL HOUSEWIVES OF NYC dropped 0.09 to 0.38. TBS’s FULL FRONTAL climbed 0.06 to 0.31. 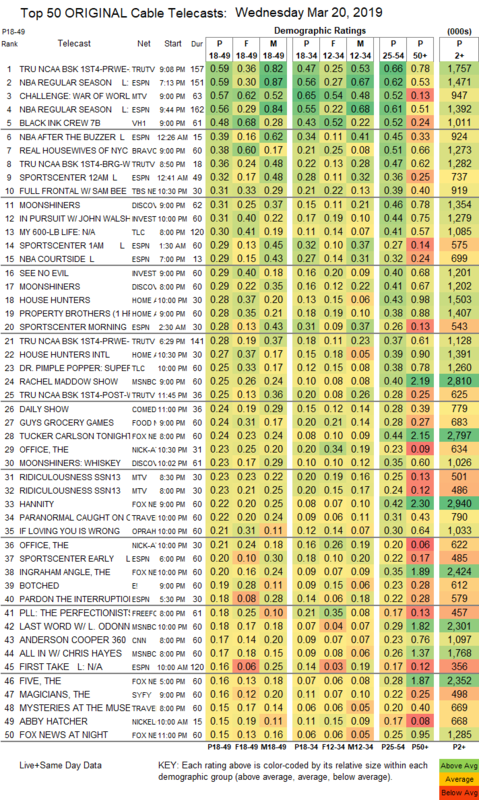 On Discovery, MOONSHINERS was at 0.31/0.29, compared to last week’s 0.36, with the lead-out hour down 0.08 to 0.23. On ID, IN PURSUIT ticked up to 0.31, and SEE NO EVIL was up 0.04 to 0.29. On TLC, MY 600-LB LIFE fell 0.11 to 0.30, and another episode of DR PIMPLE POPPER was at 0.25. On HGTV, HOUSE HUNTERS slipped 0.02 to 0.28, PROPERTY BROTHERS was steady at 0.28, and HOUSE HUNTERS INTL ticked up to 0.27. MSNBC’s RACHEL MADDOW SHOW led cable news at 0.25/0.40/2.8M, with Fox News’s TUCKER CARLSON TONIGHT at 0.24/0.44/2.8M, and CNN’s ANDERSON COOPER 360 at 0.17/0.23/1.1M. Food Network’s GUY’S GROCERY GAMES dropped 0.06 to 0.24. OWN’s IF LOVING YOU IS WRONG returned to Wednesdays at 0.21, down 0.15 from 2018. E!’s BOTCHED dipped 0.04 to 0.19. On Syfy, THE MAGICIANS lost 0.03 to 0.16, and the season finale of DEADLY CLASS was down 0.02 to 0.12. On Lifetime, PROJECT RUNWAY shed 0.02 to 0.14, and AMERICAN BEAUTY STAR. 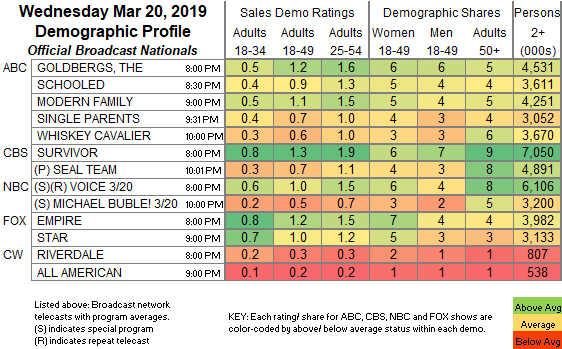 On TNT, DROP THE MIC fell 0.04 to 0.09, and THE JOKER’S WILD ticked down 0.07. On A&E, ZOMBIE HOUSE FLIPPING was at 0.09/0.09 compared to last week’s 0.11, and TINY HOUSE NATION was up 0.02 to 0.09. FXX’s YOU’RE THE WORST rose 0.03 to 0.07. POP’s SCHITT’S CREEK dropped 0.03 to 0.07. WGNAmerica’s GONE was up 0.02 to 0.05. IFC’s DOCUMENTARY NOW lost 0.02 to 0.03/118K.